Text messages sending good wishes for the holiday season can be tricky since they allow only a few words to convey a big message. 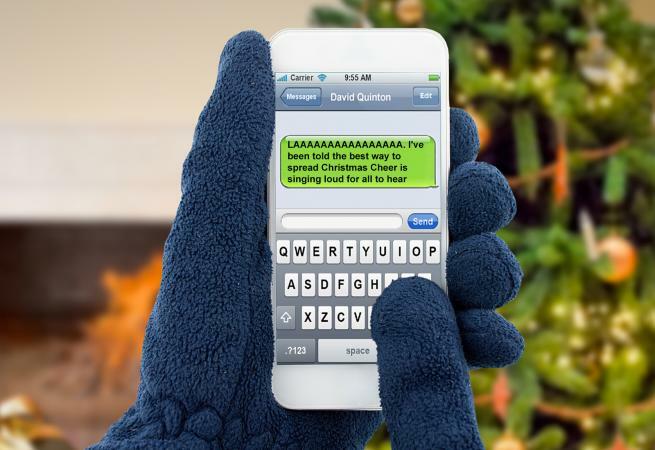 Make the most of your Christmas SMS messages by adding in elements of humor and fun. Christmas movies and popular television shows provide a wealth of great quotes and phrases for all occasions. Share holiday wishes with these fun film-inspired sayings. LAAAAAAAAAAAAAAAA. I've been told the best way to spread Christmas Cheer is singing loud for all to hear. - Inspired by Buddy the Elf in the movie Elf. This is a full-blown, four-alarm holiday emergency here. I forgot to wish you a Merry Christmas. - Based of the quote from Clark Jr. in National Lampoon's Christmas Vacation. "Merry Christmas ya filthy animal." - A quote from the movie Home Alone. "Maybe Christmas doesn't come from a store." Just don't tell Walmart! Merry Christmas. - Based on a quote from How the Grinch Stole Christmas. Here's to hoping you get what you want this Christmas and don't shoot your eye out, kid! - Inspired by the famous quote from A Christmas Story. The tradition of Festivus begins with the airing of grievances. I got a lot of problems with you and now you're gonna hear about it. A Festivus for the rest of us! - From an episode of Seinfeld. "Winter is coming." Oh, and Merry Christmas. - Based on the popular catchphrase from Game of Thrones. 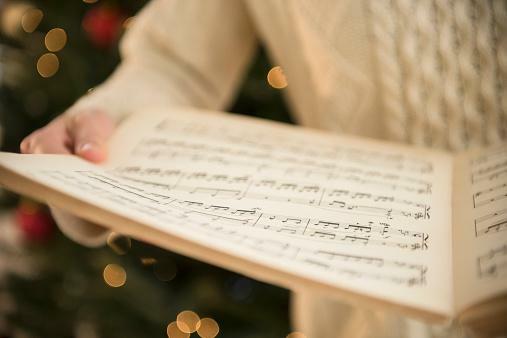 Forget caroling this year. Send your favorite Christmas song lyrics in unique ways as text messages. All I want for Christmas is you having an awesome Christmas. - Inspired by the line from Mariah Carey's "All I Want for Christmas Is You." "Have yourself a merry little Christmas, may your heart be light," and not because you just saw the credit card bill! - Based on the carol "Have Yourself a Merry Little Christmas." "Said the King to the people everywhere, listen to what I say." Seriously, listen to me. Have a great Christmas! - Inspired by a lyric from the Christmas carol "Do You Hear What I Hear." "Fast away the old year passes, fa la la la la la la la. Hail the new year, lads and lasses!" - A lesser known line from "Deck the Halls." "Have a holly, jolly Christmas. It's the best time of the year!" - From "A Holly Jolly Christmas." You better not cry, you better not pout, this message is all I'm sending out! Merry Christmas. - Inspired by the lyric from "Santa Claus Is Coming to Town." My Xmas list: hippopotamus, hoola hoop, two front teeth. Here's to hoping we all get what we want! - Based on popular Christmas wishes from funny carols "I Want a Hippopotamus for Christmas," Christmas Don't Be Late by Alvin and the Chipmunks, and "All I Want for Christmas Is My Two Front Teeth." Turn hilarious Christmas jokes, puns, or riddles into funny text messages with a few strategic changes. Happy Holidays from someone using environmental friendliness as an excuse for being too cheap and lazy to send a real card. It's all fun and games until Santa checks the Naughty List. Until then, stay naughty and Merry Christmas! Since I bought the presents, I've asked Santa to bring you love and happiness! From my family to yours, BAH HUMBUG! JK, HAPPY HOLIDAYS! I was going to send you season's greetings, but there's no salt emoji. When you stop believing in Santa, you get underwear! Keep on believing, my friend. May your longest list this Christmas be the one of funny memes to send out next year! I took your Christmas sweater as a cry for help. I'm here for you during this difficult season. Know why this Christmas text is awesome? There are no pictures of people you don't know and their pets. Send Christmas wishes without actually saying Merry Christmas by using other seasonal phrases in your texts. Merry Happy ChristmaKwanzukkah. Oh forget it, have a great holiday season! Wishing you a season filled with happiness and cheer or, if you prefer, a glass of wine or beer. May the spirit of the season not haunt you for life! 'Tis the season to be Mary. Wanna meet me at the courthouse to change our names? Sending secular seasonal greetings your way! Happy days. Yes, it's the best nondenominational greeting I could muster. I've put up with you for another year. Too bad I can't wrap that! Happy holidays. If you're feeling inspired by these examples and want to create a unique, personalized message, follow these tips. Most SMS messages hold up to 160 characters in a single blurb. Use text message symbols and abbreviations to get your point across in a few characters, or create your own unique short-hand version of a phrase. Take inspiration from your favorite holiday movies, TV episodes, songs, cards, or quotes from celebrities. Turn funny text messages into holiday-themed sayings by adding in popular Christmas items or terminology. Make sure your recipient has the right personality to receive a fun message. For some people, serious or sentimental text messages would be better received. 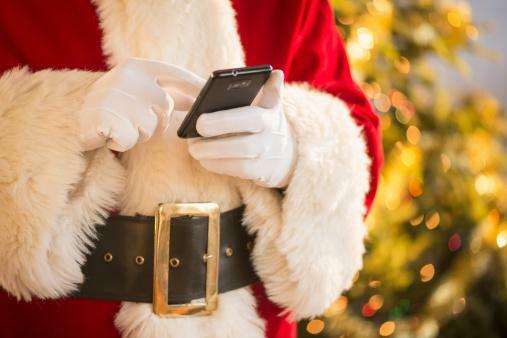 In lieu of mailing out dozens of Christmas cards, many people choose to send holiday texts. It's the thought that counts when sending out warm holiday wishes, so an individual SMS can feel more like a Christmas card than mass messages.